#DearAndy: Is the playoff committee ignoring head-to-head results? Is the College Football Playoff selection committee ignoring head-to-head results? Plus, more #DearAndy before Championship Saturday. The College Football Playoff selection committee’s first season has provided a treasure trove of questions for #DearAndy. And every time the committee does something perplexing, the questions get better. • Can we keep the playoff system but go back to the BCS standings? • Is the committee encouraging bad future scheduling with its decisions? • Is Nebraska still a top-20 job? From @Shotty1717: Why just [expletive] why? I figured I’d combine Nathaniel and David’s questions, because they illustrate the depth of emotion generated by Tuesday night’s rankings reveal. The committee’s decisions to drop Florida State to No. 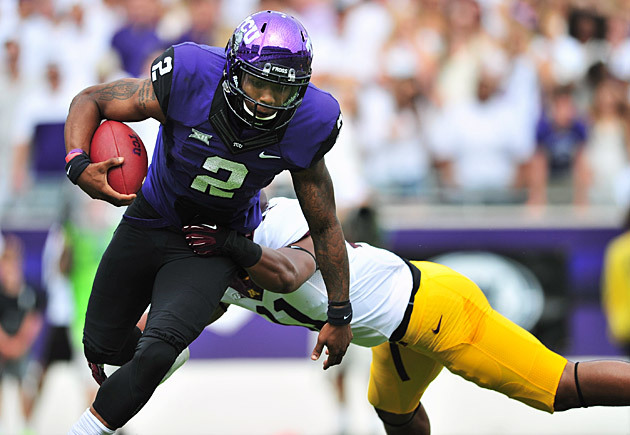 4 and to move TCU three spots ahead of Baylor to No. 3 left a lot of people -- including me -- wondering. As for Florida State, I can’t offer much criticism of the committee. I’ve had the Seminoles listed at No. 3 in my projected playoff in Punt, Pass & Pork because I believe Florida State’s skin-of-its-teeth style would be problematic against Oregon and Alabama, which have proven capable of shutting the door on opponents that refuse to take advantage of the early chances they’re given. Still, I know I’d never drop the Seminoles out of the top four unless they lost. An undefeated Power Five team that played three Power Five teams out of conference -- yes, Notre Dame counts, even though the ACC mandates it -- should make the playoff in all but the most extraordinary circumstances. The fact that the committee would drop Florida State into the final playoff spot suggests that the Seminoles could fall out even if they beat Georgia Tech in the ACC title game. Committee chair Jeff Long said on Tuesday he doesn’t believe that would happen. If Florida State wins, the 'Noles are in. Still, I find it difficult to believe this given the committee’s other head-scratcher. I get why the committee might place TCU ahead of Baylor even though Baylor beat TCU when the teams played on Oct. 11. TCU played one better out-of-conference opponent (Minnesota), and TCU’s loss (at Baylor) is much more respectable than Baylor’s loss (at West Virginia). I also appreciate the committee taking a stand on terrible nonconference scheduling, because teams will schedule better games if they think a bad slate will get them excluded from the playoff. But Minnesota isn’t Oregon or Alabama. That game should not carry that much weight. Baylor and TCU have the same record and play in the same league, and Baylor won when they played. Head-to-head has to mean something in that case, or we may as well have computers ranking the teams. Of course, Kansas State can prove the committee correct by beating Baylor in Waco this Saturday. Or Destroyer of Dreams Paul Rhoads could lead Iowa State to an upset win at TCU, but that seems far less likely. Baylor quarterback Bryce Petty suffered a concussion last Saturday against Texas Tech, but said this week that he expects to play against the Wildcats. If he does play and Baylor wins, the committee will have some serious explaining to do if it leaves the Bears out in favor of the Horned Frogs. Why? Read the next entry. From @CarltonLemley: You won't believe what the College Football Playoff media guide says about using humans over computers for rankings. The link above is the reason College Football Playoff officials give for using a committee instead of computers. Playoff organizers wanted to avoid a scenario such as the one in 2011, when Stanford finished ahead of Oregon in the BCS standings. In that season, Oregon had one more loss because it elected to open the season against eventual SEC champion LSU. Oregon also beat Stanford 53-30 in Palo Alto. The selection committee will choose the four teams for the playoff based on strength of schedule, head-to-head results, comparison of results against common opponents, championships won and other factors. Head-to-head is the second factor listed. Unless the committee thinks one game against Minnesota makes that big of a difference, it is ignoring its own mandate. From @jyrrag: Why is the ACC so undervalued? Great record against Power Five, and this season has shown the eye test is often spectacularly wrong. It appears only one league truly dominated Power Five competition, and it wasn’t the league Garry asked about. It also wasn’t the league most people assume is the strongest. Heck, the SEC didn’t even crack .500. If the committee is trying to gauge any conference superiority from out-of-conference play, the Pac-12 should get the most benefit of the doubt. Granted, this is a small sample size, but whose fault is that? If the schools want the committee to respect their schedules, they should schedule better games. That’s all we really want, anyway. From @AndyBlaho: Say Arizona beats Oregon on Friday, and all of the other teams ahead of the Wildcats win. Who is in your top four? What if Wisconsin beats Ohio State? Given the numbers above, this is a fascinating question. In this scenario Arizona would have two wins over Oregon and would be the champion of the league that might be the toughest in America. The Wildcats have losses to UCLA and USC, but would winning arguably the toughest conference outweigh that? Before you answer, take one more fact into account: Arizona didn’t contribute at all to that gaudy nonconference record against Power Five opponents. The Wildcats played UNLV, UT-San Antonio and Nevada. Then they played nine Pac-12 games and a conference championship. So, they’ll have the same number of Power Five games as Alabama, Missouri, Georgia Tech, Wisconsin, Ohio State and TCU (10). They’ll have two fewer than Florida State and one more than Baylor. They will also have no proof of their nonconference superiority other than beating some teams in the Pac-12 that performed well against foes from other Power Five leagues. When Arizona won the Pac-12 South, I thought the Wildcats would be the first two-loss team on deck to make the playoff. But without an out-of-conference Power Five victory, I’m not sure the committee would hop Arizona over a one-loss team. Though that could get very interesting if the Wildcats beat the Ducks handily.